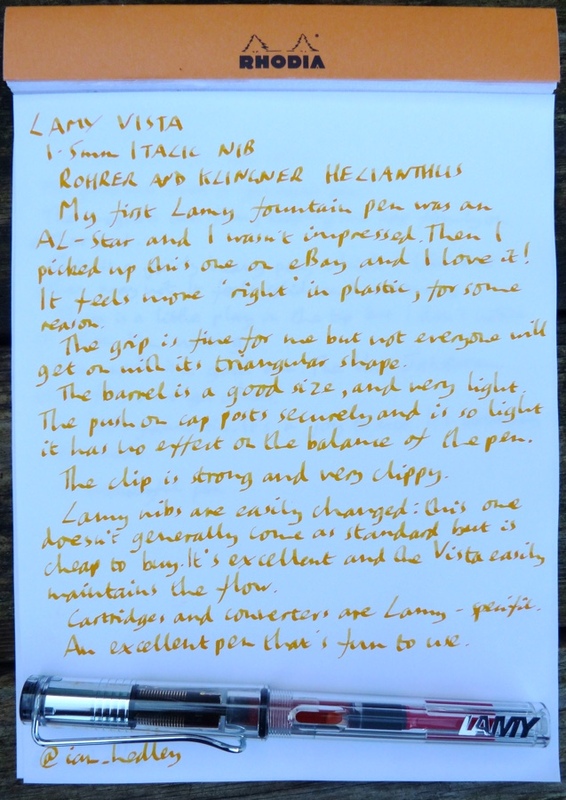 Lamy Vista Fountain Pen Review – Pens! Paper! Pencils! 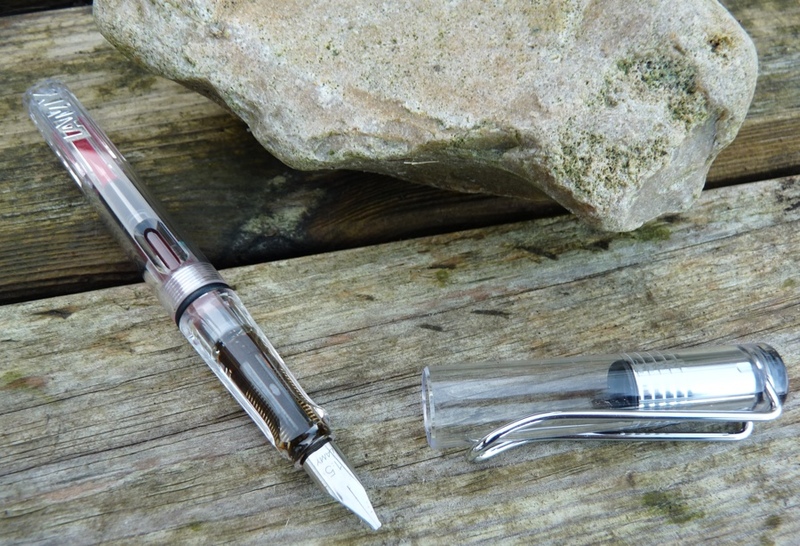 The Lamy Vista is plastic bodied fountain pen (also available as a rollerball, ballpoint and pencil). 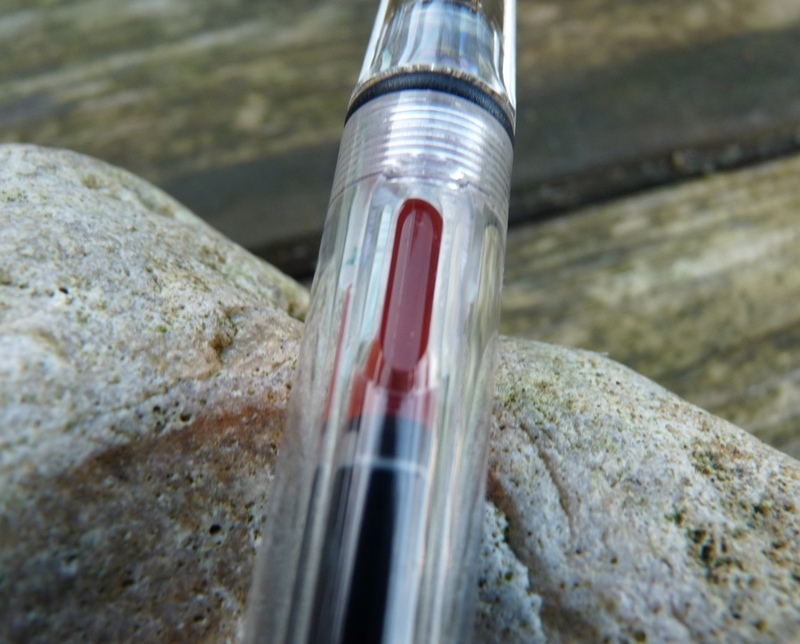 It’s available with extra-fine, fine, medium, broad and left-handed nibs at the point of sale but several italic nibs (such as this 1.5mm one) are available as extras. It costs around £14 in the UK and $30 in the USA – a rare case of something being cheaper on this side of the pond. It’s possible to find the occasional dodgy Lamy nib but it’s quite rare. I’ve got…more than I want to admit to…and only one of them has caused me problems. 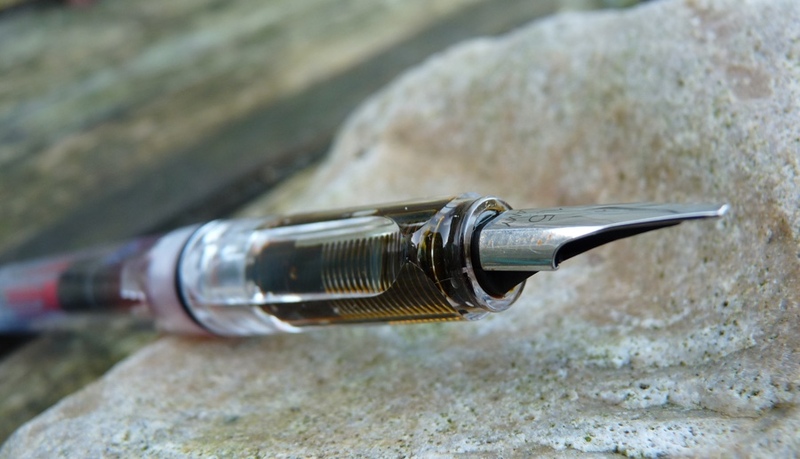 This 1.5mm nib is great and the Lamy Vista feed easily keeps up with it with all but the gloopiest of inks. It’s smooth and brings out the character of the ink. The grip is the standard Safari/Vista/AL-Star triangular affair. It suits me fine, I find it very comfortable. You may find the same. Or you may not. The only way to find out is to try. Maybe go to a real actual shoppy shop and pick one up, see how you get on. The barrel is a good size and very light, so will be comfortable in any hand. The cap posts securely and being so light doesn’t throw off the balance at all. 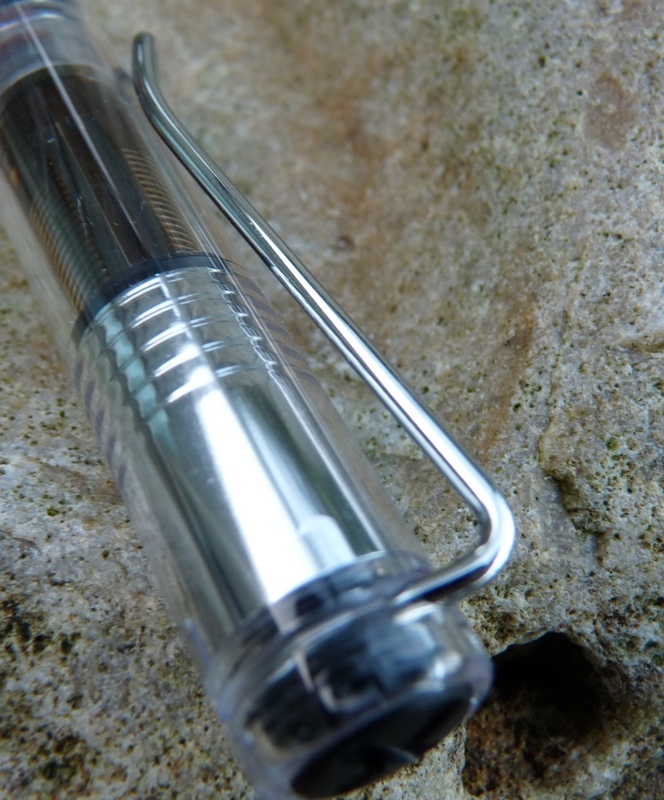 The clip is a strong loop of chrome-plated brass and not only looks great, works well too. It clips onto things. Lamy use their own cartridges and converters. Lamy converters are pretty good and aren’t expensive as these things go. When I wrote the handwritten part of this review I was under the impression my first Lamy pen was an AL-Star. It was actually a black Safari but that was a very long time ago and I lost it sometime in the distant past. I liked the Safari but didn’t have anything else to compare it to at the time. The AL-Star was an early purchase during this current obsession/interest/passion and I didn’t like it much. I still don’t. It’s completely lacking in character. I bought this Vista because it was on eBay. (That’s all it seems to take.) I’m so glad I did: it’s great! Such a fun pen. 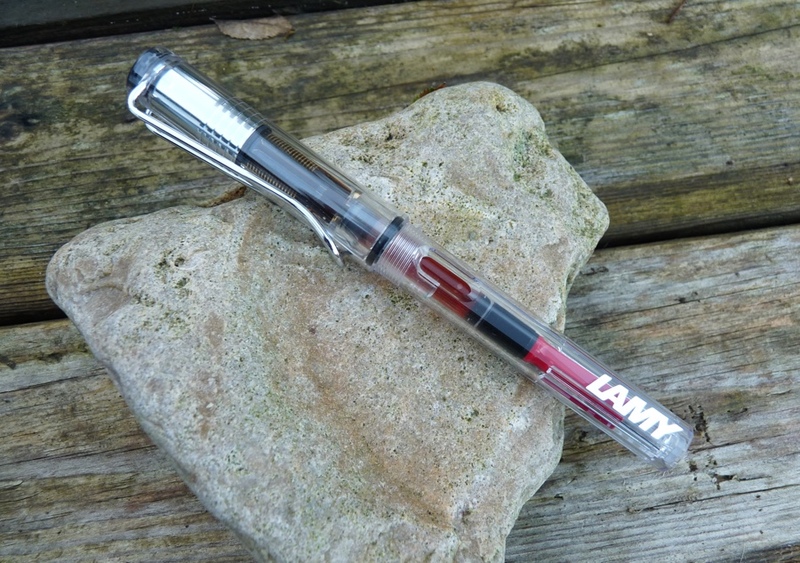 You can find some more reviews of the Lamy Vista (including non-fountain pen versions) on Pennaquod. I want so much to like Lamy pens, but I have a Vista and a Safari, and I have the same trouble with both of them–far too often on the downstroke, no ink comes out. I love the grip, but maybe I’m holding it wrong? I’ve been using Lamy ink in both of them. I’ve ordered two new kinds of ink — a bottle of Pilot Iroshizuku and some Monteverde cartridges for Lamy. I’m hoping that will make a difference. This isn’t my area of expertise at all but it seems as if you’ve been very unlucky with the nibs you’ve got. You shouldn’t have those problems at all. As I said in the review, I have had one Lamy nib that caused me problems (of the same kind you’ve had) but that’s out of maybe ten or so. Are you able to contact the vendor you bought them from? They ought to send you new nibs. If they won’t then you can try buying another but you shouldn’t have to spend more money to get your pens to work properly! It’s really easy to change the nib on a Lamy, so dont worry about that. Let me know how it goes! I have 4 Lamy pens and have replaced two nibs w/o any problem. All of them are Sefari pens. I have grown to like them so much that I use two of them daily for all my writing.